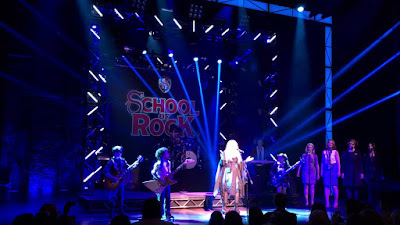 Stevie Nicks performed the Fleetwood Mac classic, “Rhiannon”, with the cast of Broadway’s School Of Rock at the Winter Garden Theatre in New York on Tuesday and video from the show is available. Based on the smash 2003 film of the same name starring Jack Black, Broadway World reports Nicks surprised the audience when she joined the cast after their curtain call for the hit from Fleetwood Mac’s self-titled 1975 album. "To be in the presence of these kids that are so amazing that honestly sometimes I close my eyes and I'm not sure that it's not Fleetwood Mac,” Nicks told the crowd. “It's very trippy. They are so good." After the performance, Nicks admitted that the appearance marked her first time on a Broadway stage. "I think this is my Broadway debut, and I'm thrilled,” she said. “It was like being somewhere between eight and 13 again. I can't wait to send a tape of this to Lindsey [Buckingham] and my other guitar player, Waddy [Wachtel], because they're gonna die. They're not gonna believe it. They're so good." School Of Rock – The Musical, which opened last December, features music from the movie as well as an original score by Andrew Lloyd Webber and lyricist Glenn Slater, with a book by Julian Fellowes and direction by Laurence Connor. Prior to her Broadway debut, Nicks joined the School Of Rock cast to perform “Rhiannon” at the 30th Annual Broadway Cares/Equity Fights AIDS Easter Bonnet Competition at the Minskoff Theatre. Celebrating six weeks of fundraising by 58 Broadway, Off-Broadway and national touring companies, the Easter Bonnet Competition raised a record-shattering $5,528,568 for Broadway Cares/Equity Fights AIDS, the largest grand total from either an Easter Bonnet Competition or Gypsy of the Year fundraising campaign in Broadway Cares history. Broadway Cares/Equity Fights AIDS is one of the nation’s leading industry‐based, nonprofit AIDS fundraising and grant‐making organizations. By drawing upon the talents, resources and generosity of the American theatre community, since 1988 BC/EFA has raised more than $285 million for essential services for people with AIDS and other critical illnesses across the United States.